It seems caution is the watchword for billions of cell phone users across the world after a report published by the International Agency for Research on Cancer (IARC), indicated that radiation from cell phones posed an increased risk for brain cancer. The IARC, which is the World Health Organization’s (WHO) cancer research agency, has classified ‘radiofrequency electromagnetic fields as possibly carcinogenic to humans (Group 2B), based on an increased risk for glioma, a malignant type of brain cancer, associated with wireless phone use’. While many cell phone users are concerned, others are least bothered with the study findings. Many, though, have already pressed the panic button and are consciously cutting down on their talk time. For example, Rahul Jain, stock investor from Malad (W), after reading the latest report by WHO, has decided to use his mobile only when it is important. “The nature of my job is such that I have to constantly be on the phone. But mobile-related health hazards are always on my mind. A lot of people believe that cell phones have now become an integral part of their life and it is next to impossible to do without them. “We’re youngsters and how could we possibly live without mobiles?” asked Devyani Sabnal (20), student of SIES college, Sion. Arjun Pathwar (19), student of Narsee Monjee Institute of Management Studies (NMIMS) at Vile Parle too echoes a similar sentiment. “I am not bothered at all with this study. My friends too are aware of the study but we just don’t care. Mobiles are one of the most effective forms of communication and if it is established that usage of cell phones can cause cancer, then we shall see what to do later. We can’t be bothered now,” elaborated Pathwar. But doctors believe that, not paying heed to these warnings might prove dangerous for people in the long run. Hence it’s better to be safe than sorry. “By the time the results come out, which can clearly indicate that cell phones can have serious health hazards, many might have already lost their life. In fact we see a lot of kids who come to us to seek treatment for brain tumour, etcetera, and we prescribe minimum usage of cell phones for such patients,” said Dr Arvind Kulkarni, Director, Radiation and Oncology, Lady Ratan Tata Medical Centre, Cooperage. Dr Ashok Waghmare, a neuro physician recollects a case where one of his patients complained of severe headache and dizziness. “I suggested a few painkillers but he got no relief. After inquiring about his lifestyle, I got to know that he was a medical representative and had to use the phone constantly. So I suggested that he put the phone on loudspeaker while talking. Waghmare further adds that using loudspeakers dissipates radiation from the phone to the surroundings and, “there is no direct connection with your ear. As a result, the radiation does not affect your brain too much. However, the best option is using landline phones.” Longer the distance, lesser the effects of radiation, say doctors. Most people in the age group of 25-40 have problems related to excess cell phone usage, says Waghmare. Doctors are concerned with cell phone usage among kids too. Shroff says that her five-year-old daughter, Riddhima too wants a mobile phone, “but we explain to her in simple terms that the mobile is bad for her health.” From safety issues to lack of sleep to other health issues, cell phones can affect kids in a lot of ways. “Cell phones do concern parents. Some believe that it can impair their child’s hearing ability. Others express concern that too much usage of mobiles can lead to anxiety, irritation and lack of sleep,” said Arundhati Chauhan, President, Parent Teacher Association (PTA) United Forum. Children and teenagers should be discouraged from using cell phones as, “Children and teenagers are more sensitive to genetic mutations than grown ups. Also, do not keep phones close to your head while sleeping. Switch the phone off at night,” said Kulkarni. Nearly 5 billion people worldwide have mobile phones. In India itself, nearly 800 million people use cell phones. The WHO had set up an expert panel to evaluate the effect of cell phones on the human body. On May 31, 2011 the expert panel said that cell phones might possibly cause side effects. In finding cell phones to be “possibly carcinogenic,” the IARC panel stated that heavy cell phone use might or might not cause a specific form of brain cancer called glioma. The finding means that research is urgently needed to find out whether cell phones actually cause cancer. It is to be noted that the present panel report does not report any new finding of a study. Rather it is the expert opinion of eminent leaders in scientific thought, based on the current literature. As of date, no study has categorically implicated cell phones as a causal factor for brain tumour, although there have been suggestions to that effect. Lifetime exposure to the magnetic fields created by the phones is rapidly increasing. 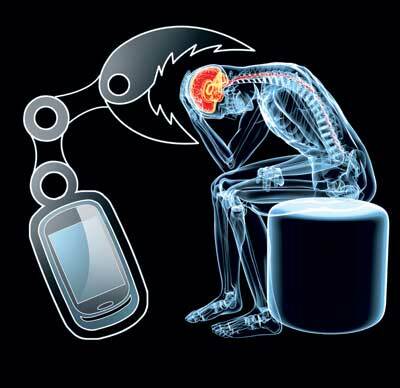 Cell phones are held tightly against the head. Also, children are at particular risk, not only because their skulls are thinner but also because their lifetime exposure to cell phones is likely will be greater than the exposure of current adults. The effects of cell phones take long to manifest. In some cases this duration may be 10 years or more. Finally, cell phone technology is rapidly advancing and it is claimed that the electromagnetic exposure is progressively less with newer phones. Electromagnetic radiation is governed by an interesting law known as the inverse square law. What this essentially means is that if we increase distance from the source by a factor of 2, the exposure gets reduced by 1/4th. It is for this reason, that distance from the device is a critical saving factor from side effects of the cell phone, if indeed they are proven to have such effects. Till we get further evidence on the issue, it may be appropriate to observe the following precautions. Cell phones may be used whenever they are really needed. For most routine work and casual talks, use the regular landline connection. Discourage children from excessive use of cell phones. Whenever possible, use a wired ear piece connected to the cell phone. Avoid cell phone use when the signal is weak. Consider alternating between left and right ear while talking on cell phone. Use texting (SMS) instead of calling if possible. Radiation from mobile phones and other electronic devices such as microwave ovens, has been a concern for the medical community for many years. The atmosphere is full of invisible electromagnetic emitted from radio, television, computer, etcetera. These electronic gadgets have become an integral part of our life and we cannot really do without them. But people can exert caution as far as their usage is concerned. Although medical journals have often published reports, which state that a, “definite link between these radiation and cancer has not been proven yet,” I believe that, there is no point in waiting for such results to emerge. Men risk wrecking their fertility if they don’t curb their cell phone use. Researchers have found that cell phone use may also lead to low sperm quality and a decrease in fertility. “Our findings were a little bit puzzling,” said Rany Shamloul, postdoctoral fellow in pharmacology and toxicology at the Queen’s University, Canada, who led the study. “We were expecting to find different results, but the results we did find suggest that there could be some intriguing mechanisms at work,” said Shamloul. The team discovered that men using cell phones reported higher levels of circulating testosterone but they also had lower levels of luteinizing hormone (LH), an important reproductive hormone that is secreted by the pituitary gland in the brain. Researchers hypothesize that electromagnetic waves (EMW) emitted by mobiles may have a dual action on male hormone levels and fertility. EMW may increase the number of cells in the testes ; but by lowering the levels of LH, EMW may block the conversion of basic circulating type of testosterone to the more active form of testosterone associated with sperm production and fertility. The government assured that India would adhere to best global and scientific benchmarks while drafting the final guidelines in the telecom sector. The government’s reaction comes in the backdrop of a latest WHO report which says cellphone use can possibly cause brain cancer. “While telecom is a huge success story in India, we have to ensure that any possible health related effects of radiation emitted by mobile phones and towers are reflected in the guidelines. The final guidelines would take into account the best global benchmarks and scientific evidence on the subject,” said Minister of State for Communications and Information Technology Sachin Pilot. The government in August last year, had set up an inter- ministerial group to evaluate the evidence, re-visit radiation guidelines for mobile towers and adopt guidelines for radiation emission by cell phones. The group had made it mandatory for cellphone manufacturers to declare the radiation level of each mobile handset on the packet itself. Thanks for your great information. We all appreciate your information and try to take precautions in routine too. Keep posting these kinds of nice blogs. Next Next post: ANALYSIS: Are we being told the full truth about GM mosquitoes?